The concept for Mashi River Safaris was borne out of the notion that todays tourists in Namibia and Africa as a whole are looking for more and more adventure in their itinerary's and despite the lodges in the region already offering boat cruises/sundowners on the river some people are looking for something a little extra. Mashi river safaris gives the more avid adventurer the chance to immerse themselves in the special atmosphere that the Mashi/Kwando floodplains create. Extended time on the river means more to see with regards to animals and birds and also gives people the chance to participate in activities such as sport fishing and game walks at their leisure. We are an owner-run outfit and prefer to focus on small groups to ensure that each and every guest is given maximum attention and aim for minimum disturbance to the environment. In addition to full day trips we offer the chance to overnight on the river at specially chosen wilderness campsites. We carry all camping equipment onboard our stable pontoon boat which makes an ideal platform for photography. We also offer walking trails in our conservancy areas outside of the national parks where reintroduced game exists alongside existing resident game as we feel that it is very important to give these animals value to ensure continued success in our community's efforts to conserve them. As an operator who is passionate about conservation we are fully aware that in utilising this wonderful resource we must also take a responsible attitude toward protecting it. We have a code of conduct which we abide by on the river incorporated into our company procedures and each new staff member is briefed and trained to obey this. The code of conduct also applies to guests as a means of causing minimal disturbance to the environment and they wll be briefed prior to departure. We operate on a minimum impact camping ethos and aim to leave our campsites just as we found them. 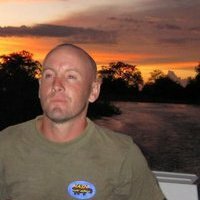 The owner and manager of Mashi River Safaris is Dan Stephens, originally from Middlesbrough in the UK. Dan travelled independently in southern Africa for a full year from 2002-2003 spending 90 percent of the time camping in national parks throughout the region and returned to Africa in 2007 to complete a field guiding course in the Caprivi region, actually based on the Kwando river. He decided that this was the place for him and after working at various lodges in the area and building a solid knowledge of the parks and wildlife in the region Dan set up Mashi River Safaris and began to operate fully in 2010. Dan has an undying passion for the African bush and the Caprivi with its 3 wonderful parks in particular. In addition he has a sound knowledge of the entire KAZA region and its highlights. His greatest pleasure is sharing it with others.